Tagline The new perfume for women. Print/TV Campaign Crystal Renn (model) wearing dress from Reem Acra Spring 2013 Resort Collection, shot in Central Park, NYC by photographer Tom Munro. Inspired by the appreciation for tradition and modern glamour, renowned packaging designer, Doug Lloyd of Lloyd & Co. opted for an elegantly sleek glass flacon. The luminous glass is embellished with Ms. Acras insignia, a whimsical dove pattern that reflects regal tradition from the East. The glass is bordered in rich gold and topped with an architecturally modern cap, while the red detail on the collar is a tribute to royalty. The secondary packaging is equally rich with its luminous, gold coloring and matching dove pattern. Together, primary and secondary packaging are the perfect counterpart for a fragrance that exudes both classic heritage and modern elegance. Inspired by Ms. Acras memories of collecting amber as a child in the forests of Lebanon, acclaimed Perfumer Pierre Negrin of Firmenich created a sleek, sheer amber effect apparent throughout the entire fragrance and balanced it with shimmering fruit, voluminous flower petals and sensual musk. 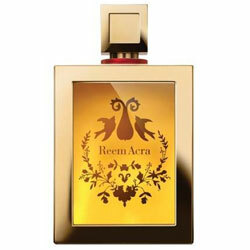 Reem Acra Eau de Parfum redefines couture perfumery. Heritage ingredients are married with Ms. Acras childhood memories and unique artistic vision. The result is a signature scent that evokes elegance, graceful confidence and feminine sensuality. "Reem Acra Eau de Parfum is warm, sultry, mysterious and rich. It is both classically elegant and uniquely contemporary," said Negrin. Fashion Scents - Because no outfit is complete without a luxe designer perfume to match. The allure of designer fragrances can be traced back to the launch of Coco Chanel's famous No. 5 in 1921, and the rest, as they say, is history. Since then, thanks to the busywork of fashion's finest houses from Saint Laurent to Valentino, such sparkling incarnations have become ubiquitous. This spring, newcomers like Reem Acra, who was inspired by heady amber notes from her native Lebanon, and L'Wren Scott, whose blend is spiked with rock-and-roll-esque absinthe and star anise, join the club with the debut of their namesake perfumes. So spray on: A sartorially inspired scent is a fashion lover's best accessory. Orange blossom lightens up this rich amber-infused blend. Reem Acra, eau de parfum, $125 / 3 fl. oz. ; at Saks Fifth Avenue.